Dexter and I had another dog-friendly weekend trip recently. This time, our dog-friendly trip took us to the DC area. The weekend was going to be fast and furious, because our weekend trip was really about a dog behavior workshop I was presenting on fearful dogs. The folks at Your Dog’s Friend asked me to present a dog training workshop on Saturday afternoon, so that left me with Friday evening, Saturday morning and Saturday evening to tour the area with Dexter and our other friends Levi and Chris. When I’m searching for a dog-friendly hotel, I look for five things I want in my dog-friendly accommodation. When I was looking for a pet-friendly hotel in the DC/Baltimore area, I found Extended Stay America – Washington D.C. – Tysons Corner. The hotel is located at 8201 Old Courthouse Rd., Vienna, VA, which was about 15 minutes from where I was going to be presenting my workshop on fearful dogs. After reading some reviews, the hotel sounded like it would be a clean, friendly, and safe hotel to call home for the weekend. Dexter and I have stayed at other Extended Stay America locations in the past, and have been very happy. What I really like about Extended Stays is that the hotel rooms are designed for longer stays, so are spacious and feature a substantial kitchen area with a full refrigerator/freezer, microwave, stovetop, and dining and cooking utensils! This is a pretty big deal for me, since I bring Dexter’s home-cooked dog food, and sometimes even cook for him on the spot. 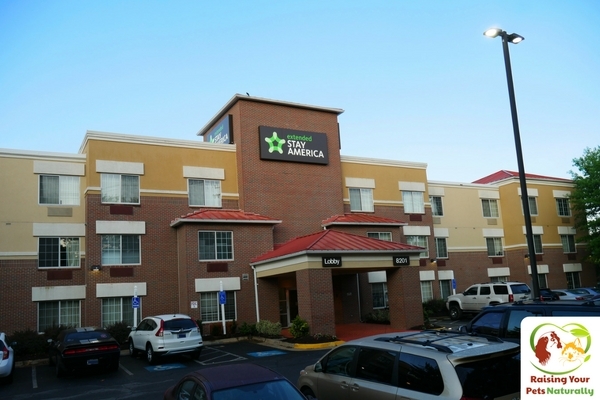 The Extended Stay America – Washington D.C. – Tysons Corner also has an on-site guest laundry, free Wi-Fi, grab-and-go breakfast, flat-screen TVs, iron and ironing board, generous workspace, and updated bathrooms. Speaking of updating, this location is in the middle of some renovations and they had just laid the hallway carpet, so there was a “new carpet” smell in the halls. This, however, did not affect my room and there was not an odor in my room. Since Dexter and I were traveling with friends, we booked the studio suite with 2 queen beds. The studio suite was perfect for our weekend, with plenty of foot space, chairs, hanging space and drawers to more than accommodate our weekend. The hotel beds were comfortable and even included a mattress protector. I always look at my mattress to check for bed bugs or dirt. The mattress was sparkling white and crisp—just what I want to see. The inside of our room was clean and fresh, including the bathroom and kitchen. The outside of our Extended Stay America had lots of grass for potty breaks and plenty of sidewalks around the property to choose from. There was also a small partially-enclosed courtyard for potty breaks. The hotel felt very safe and I had zero concerns walking Dexter around any part of the hotel, which was very comforting. Hotel safety is so important since I tend to travel alone and Dexter needs frequent potty breaks at various hours of the day and night. 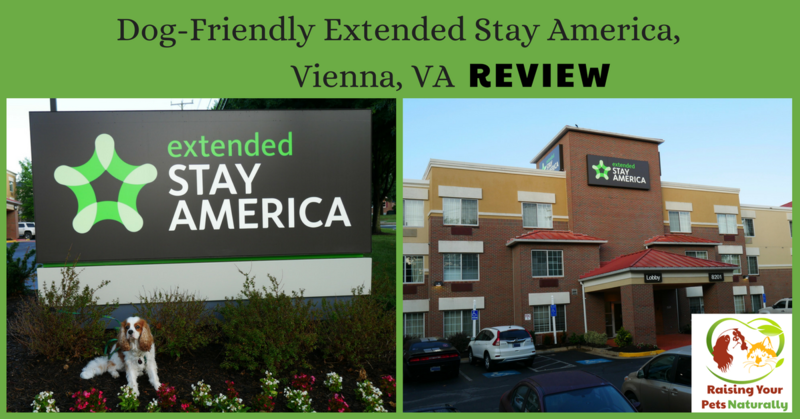 Our stay at Extended Stay America was a great experience. The hotel was nice, quiet, safe, and a great location. Our room was comfortable in every way, including the beds and bedding. The big TV had good reception, and so did the Wi-Fi. The towels were clean and the bathroom was stocked with shampoo and soap. The hotel met my five criteria of being safe and clean, in a good location, with refrigerator and friendly staff, I would certainly stay at the Extended Stay America in Vienna, Virginia again. For more information on finding a dog-friendly Extended Stay America on your next vacation, visit their website. That’s good info! We generally don’t take the dogs into hotels, but you never know when we may choose or need to! It’s good to know that the Extended Stays are dog friendly, and that you’ve had good experiences! 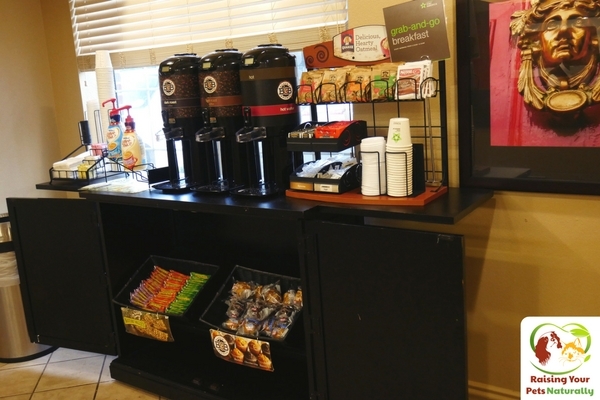 This is a good to know article – featuring “Extended Stay America” not only because of their good amenities, but also that they are pet / dog friendly. 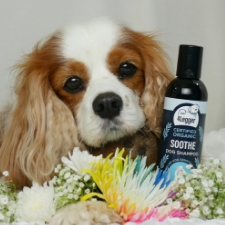 This will be helpful for dog lovers who opt to bring their loved pets during vacation or trips. Thanks, Eliza. It’s so nice to find a dog-friendly hotel that is nice, safe and clean like the Extended Stay! That is so lovely that you found a nice hotel that will let your pups in. I dont have a dog anymore nor have I ever traveled with him before but I would love to see more puppy friendly hotels. I’m such a dog person. It can be difficult finding hotels that one, take dogs, and two, when they do accept dogs, the hotel is “nice”. 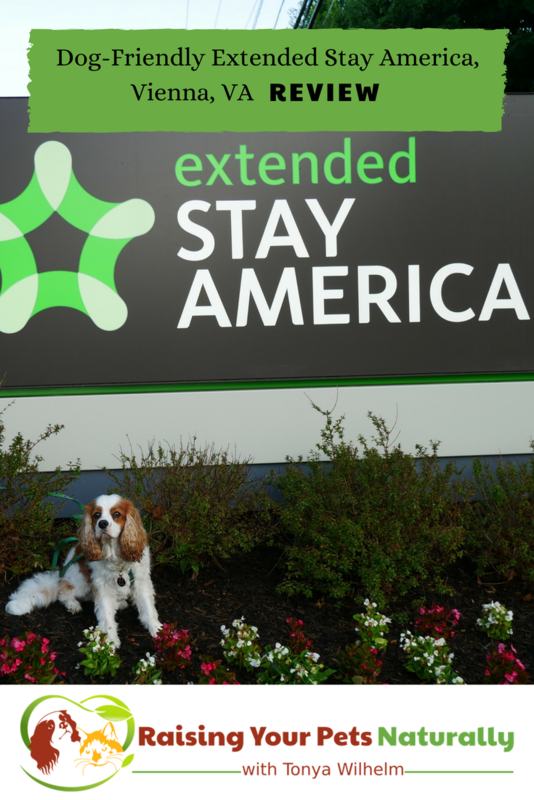 The Extended Stay America sound like the perfect place to stay when traveling with a dog. Thanks for making me aware. Sure thing! Also two dogs. Some hotels only allow 1. I love how accommodating they were and the large room. We love Extended Stay!! Glad you had a great time. 🙂 It’s always refreshing to hear about dog friendly hotels. Bring your dogs! Ya! Another fan. Glad you had a nice stay. Dexter is ridiculously handsome. Every photo that he graced felt like a little slice of amazing thanks to his handsome self! I absolutely LOVE accommodations that allow pets. They are such a big part of our lives and it only seems natural to bring them alone. We don’t have a dog (only cats), but whenever we stay at a hotel and I hear dogs barking in the rooms and see them walking in the halls…I LOVE IT!!!!! Pets just make EVERYTHING better!!!! Also I’m incredibly jealous that you have hotels like this! I have a dog myself and I finding a hotel that actually allows dogs in is very rare but this sounds extraordinary. I really hope this blog post gets seen by people around me because I’m a strong believer that dogs should be allowed into hotels. Travelling with your animals is a special experience and I really think places like this are doing a good job! thanks so much for this post! I’m going to be telling every hotel I go to now that other places like this allow dogs so why can’t they. So good to know! I’ve stayed at some that vary in cleanliness, but people are generally pretty good. I think the key is management that can tolerate a barking dog or two. I learned the hard way that Sophie will bark even if I leave the room for 30 seconds to get ice. Nobody asked us to leave. I consider that a win. lol With Dexter’s home-cooked meals, it’s on the top of my list. 🙂 Magical-Dawg would have lots of room for treats! When we were growing up, we traveled with our dog. 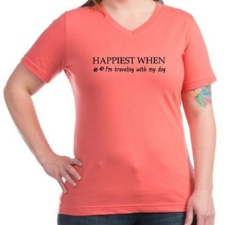 (I have a cat, and she’d be stressed out if we tried to travel with her.) I love that there are options for families traveling with their pets! This is awesome info! 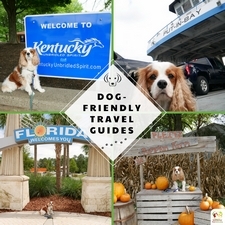 We rarely ever travel with our dog because it’s hard to find pet-friendly hotels, and even harder to find good ones! Glad to share the Extended Stay. All their locations are dog-friendly! All of the Extended Stays are pet-friendly. Yes, fridge is very important to us. Great point about meds too. This sounds like a nice concept to cater for pet lovers. I don’t have pets but it’s good to know hotels that are pet friendly. Thanks! It’s a great family hotel too. We only travel with our dog if we’re staying with family precisely because it’s a little challenging to find dog friendly hotels. This looks like a great place! Will definitely check it out. I’m glad this hotel worked so well for your trip with Dexter. I hadn’t considered how the safety of the surrounding area would be important for dog-owners. That’s a definitely a good thing to research when choosing a pet-friendly hotel! Thanks, Liz. Yes, those potty breaks can be scary when you are staying in an unfamiliar place. So glad this Extended stay was well-lit and felt like a great area and part of town. It’s good to know which hotels are pet-friendly and which are not. There aren’t many around here and those who do claim are pet-friendly have size restrictions and other limitations. Fortunately, we don’t really travel. This is great information. I’ve never traveled with the girls, but I need to know specific hotels that would take them in should an emergency arise or if I decided to begin traveling with them. I imagine it’s a lot harder than we think. Great points! I actually have a printed list of dog-friendly hotels within an hour from me. You never know when you may need it. I would imagine in the South, it’s important too. Always nice to find the hotel the pets can come to. I know boarding can get so expensive. Plus Im sure the pets loved it! The hotel looks beautifully kept and I love that they are dog friendly! It sounds like although you had a whirlwind trip, you definitely didn’t have to worry about accommodations. Thanks, Heather. We do travel fast and furious when I speak. It was so nice to settle back into the Extended Stay’s comfortable beds! I would have never thought to stay in Tyson’s Corner when visiting DC. But it makes a great base for the surrounding area without going into the city. I’ll definitely check this place out next time I take my dog for conferences in DC area. Thanks! So glad to help! Yes, we tend to try to stay just outside of the city. This spot was in between my workshop and our day trip. we have never taken our dog to a pet friendly hotel before, it sounds like a great idea though! I’m sure he would love it! I find it to be the only way to travel. It’s just not any fun without Dexter. I think it’s a great idea that they have pet friendly hotels. It’s not always easy to leave a pet behind it can be like leaving a family member. So true. I left Dexter one time with my Mom and I will never do it again. I was lost without him! Great post, and these people DO look good to stay with! I like that they care enough to put down new carpets this showa corporate pride – good for them – right? One thing I always want to know is how quiet a hotel is. It is critical to use as without sleep we have had holidays ruined. I love that they were so friendly and helpful and gave you enough space for two dogs. You must have been overwhelmed by their willingness to accommodate you and Dexter ! It was wonderful! Dexter and Levi felt like Kings hanging out on their thrones. Glad to help! It’s so nice to stay in a place that has the amenities like the Extended Stay, especially when traveling with dogs. I’ve never had to look for a pet friendly hotel, and these are good tips to keep in mind if I ever have to. I’ve seen Extended Stays in this area. Dexter is just adorable. Thanks for sharing this review. We’ve never stayed at this chain before. It’s always good to have options – especially when looking for Pet-friendly places. Also, I prefer to have referrals from other pet parents. Much appreciated. Great info! I had never heard of Extended Stay! I’m Pinning this for future reference. I do not travel much (with five Siberian Huskies), but if we do travel in the future, this is a great resource to have! Thank you!!! 5 would be a challenge! hahaha Thanks for pinning. That’s so cool that they have hotels that will take in dogs. I know I would have a hard time going on a vacation without my dog at this point. And my daughter wouldn’t want to leave him while we went away. It sounds like this was a great choice! 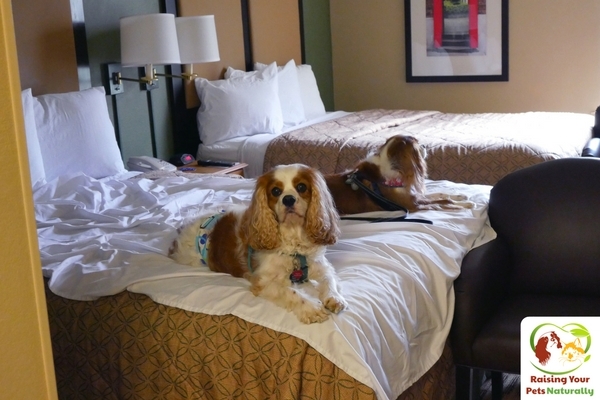 We stayed at dog-friendly hotels on our BlogPaws trip. I was pleased with all of the hotels we stayed in. I think a lot of hotels are starting to realize that pet people appreciate clean and comfortable rooms. Great post. Its so much easier to bring my pups with me when I travel than to leave with a pet sitter and finding dog friendly hotels isn’t as easy as you would think! So true Christie. I left Dex once with my Mom and I was so lost without him. With food allergies we are always looking for hotels with kitchens in them, Extended stay is one of our favorites! This looks like a great way and love that it is pet friendly! What a great point about food allergies! I’m so glad you enjoy Extended Stay Americas too. Great chain. Thanks. It was a great choice and I’m so happy we chose the Extended Stay! Oh, that’s too bad. I do a lot of digging prior to our trips, emailing and calling. We get nos, but can find enough yes answers to have a great trip! good feeling having to spend quality time with your pets when on vacation. i like this. It really is a great way to spend the holiday. I enjoy that time with my dog, not worrying about work, just fun and bonding. This is really good to know! I might be travelling with my dog soon and we’ll need to find some pet-friendly places to stay. Wonderful! I have an affiliate link and discount here in the blog. I highly recommend checking out Extended Stays. 🙁 That makes me sad. That’s a very cool and spacious place to go with your pets. Good to have that kind of hotel in our place. This is so nice to have such places. It really is. I so appreciate a nice dog-friendly hotel chain. nice and informative article. i am also a dog lover. i have also one dog in my village . thanks for sharing this information. Hi, Raushan. You bet! 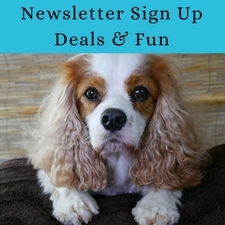 I love sharing dog-friendly adventures and hotels. pet-friendly hotels are great, hope there’s one everywhere, since it’s hard sometimes to travel with pets! Agree. It can be challenging finding safe and clean pet-friendly hotels. Luckily, there are quite a few Extended Stay Americas! Dexter is such a cute dog that I’d like to have his twin brother 🙂 I had no idea in the world there are hotels who are not dog-friendly and you have to search for one. I though every hotel should have accommodations for people traveling with their pets. Thanks, Perla. Dexter does his best. That would be amazing if all our family members (pets are family) would be able to easily join us. That’s great you found an accommodating hotel! I live in the D.C. area and can imagine that would be hard to find. Pet friendly hotels are the best! I wish I had known this while driving up with my pets from Florida to Massachusetts! At least I know now if I ever decide to take that trip again! Massachusetts is on my bucket list! We went on a dog-friendly cruise in Florida- https://raisingyourpetsnaturally.com/dog-friendly-florida-boat-cruise/ If you are in the area. This is the problem of almost all the pet owners, the accommodation for pets! My aunt always faces this problem. Thanks for sharing, I’ll show this to her, she’ll probably be really happy! Thanks, for sharing. I love sharing great dog-friendly hotels. As a single female traveler, it’s important to find one that is clean and safe. Thanks for sharing these tips – I’d have never even considered taking dogs on holiday! Sure thing. The best part of my trip is spending time with my pup! ooooh! I love pets but i dont own one yet. Let alone find an accommodation for them. Great piece of information. I am sure so many people would be glad to hear this. Thanks, Christiana. I hope it’s a helpful review. So glad that you and dexter had such a great time, in this clean pet friendly hotel. Loving that they even supply mattress protectors. Me too. Those mattress covers were so appreciated. This is a very useful post! It is sometimes hard to find a pet friendly hotel when traveling! This place looks so amazing, especially for pet lovers like you. I’m not sure if we have any pet friendly hotels here in ph, but our malls are. That would be fun to go to a mall with Dexter. Thanks for sharing this review. Honestly, this is the cutest thing I have ever read…everyone deserves a good vacation! Awe, thanks. 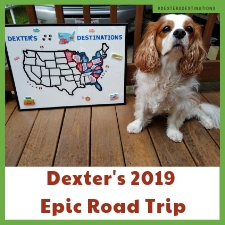 Dexter loves his vacations, full-time family time! It sounds like this hotel was perfect for your stay. It’s good to know you’ve been happy with other locations as well. I don’t have a dog but do travel with my cat on occasion and I know how hard it is to find an acceptable accommodation. I don’t have a dog but I think it’s a terrific service to offer pet owners. Traveling with a beloved pet can be stressful so finding suitable accommodations is key. I totally agree. The Extended Stay is a great option!